The image shows the configuration of Mercury, Venus, and Jupiter in the western sky just after sunset on May 26, 2013. Insets show the relative size appearance of the planets on that date. The solar system is a busy place, with five wandering planets visible to the naked eye alone. 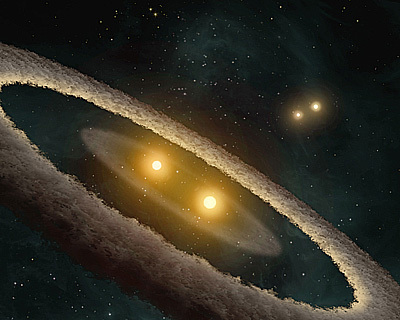 When any two pass close by each other from our point of view, we see an astronomical conjunction, but on very rare occasions, three planets will find themselves grouped together: a triple conjunction. Towards the end of May, Mercury, Venus and Jupiter will treat us to the best triple conjunction in years. On May 25th, Mercury will pass within 1.4° of Venus, then two days later Mercury comes within 2.4° of Jupiter, and finally on the 28th, Jupiter and Venus approach within 1° of one another. If it weren’t for the slight orbital tilt of our solar system’s planetary orbits, these conjunctions would all be occultations instead. During the nights of May 26th-27th, all three planets are visible immediately after sunset within the same 3° field of view, with the triple conjunction peaking in a triangular shape on the 26th. (For scale, the full Moon subtends about 1/2°.) 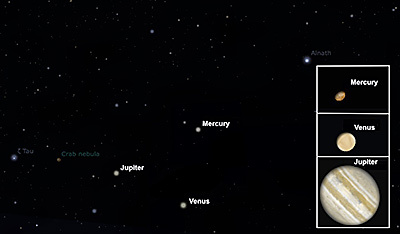 The three planets appear close together for a few days more, making a line in the sky on the 30th/31st. How does this happen? Mercury and Venus race around the Sun far faster than Earth, with Mercury completing more than four revolutions around the Sun for each one that Earth makes. At the same time, Jupiter is far slower, taking 12 years to orbit just once around the Sun. Jupiter’s been high in the sky during the early parts of the night, but steadily lowers throughout May as Earth continues to move away from it, approaching its maximum distance from Earth. Mercury and Venus, meanwhile, begin to move out from behind the Sun during May: Venus at the beginning of the month and Mercury in the middle. Thus, during this triple conjunction, all three planets will be on the far side of the Sun, something that happens just 25% of the time in triple conjunctions involving Mercury and Venus! If you telescopically resolve these planets into disks, you’ll see our inner worlds in a nearly-full gibbous phase. Jupiter will appear largest in terms of angular diameter, followed by Venus and lastly by Mercury. Just a year ago, during its now-famous transit, Venus took up more than a full arc-minute in the sky; during this conjunction, it will just one-sixth that angular size and less than a third the apparent diameter of Jupiter. Nevertheless, Venus will still be more than six times as bright as Jupiter during this time, outshining all night-sky objects other than the Moon. Closer conjunctions of two naked-eye planets are frequent, but getting three or more like this happens just once or twice per decade, so don’t miss your chance to see it. And speaking of occultations, The Space Place has a great kid-friendly explanation of the Venus transit and solar eclipses of 2012 at spaceplace.nasa.gov/venus-transit. Dr. Ethan Siegel, a theoretical astrophysicist, is a professor at the University of Portland (OR) and Lewis & Clark College. 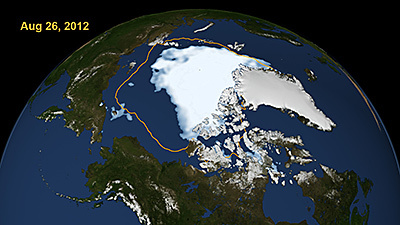 This image from September 2012, shows that the Arctic sea is the smallest recorded since record keeping began in 1979. This image is from NASA’s Scientific Visualization Studio at Goddard Space Flight Center. In some ways, we know more about Mars, Venus and the Moon than we know about Earth. That’s because 70% of our solar system’s watery blue planet is hidden under its ocean. The ocean contains about 98% of all the water on Earth. In total volume, it makes up more than 99% of the space inhabited by living creatures on the planet. As dominant a feature as it is, the ocean — at least below a few tens of meters deep — is an alien world most of us seldom contemplate. But perhaps we should. The ocean stores heat like a “fly wheel” for climate. Its huge capacity as a heat and water reservoir moderates the climate of Earth. Within this Earth system, both the physical and biological processes of the ocean play a key role in the water cycle, the carbon cycle, and climate variability. This great reservoir continuously exchanges heat, moisture, and carbon with the atmosphere, driving our weather patterns and influencing the slow, subtle changes in our climate. The study of Earth and its ocean is a big part of NASA’s mission. Before satellites, the information we had about the ocean was pretty much “hit or miss,” with the only data collectors being ships, buoys, and instruments set adrift on the waves. Now ocean-observing satellites measure surface topography, currents, waves, and winds. They monitor the health of phytoplankton, which live in the surface layer of the ocean and supply half the oxygen in the atmosphere. Satellites monitor the extent of Arctic sea ice so we can compare this important parameter with that of past years. Satellites also measure rainfall, the amount of sunlight reaching the sea, the temperature of the ocean’s surface, and even its salinity! Using remote sensing data and computer models, scientists can now investigate how the oceans affect the evolution of weather, hurricanes, and climate. In just a few months, one satellite can collect more information about the ocean than all the ships and buoys in the world have collected over the past 100 years! NASA’s Earth Science Division has launched many missions to planet Earth. These satellites and other studies all help us understand how the atmosphere, the ocean, the land and life — including humans — all interact together. Find out more about NASA’s ocean studies at http://science.nasa.gov/earth-science/oceanography. Kids will have fun exploring our planet at The Space Place, http://spaceplace.nasa.gov/earth. This article was written by Diane K. Fisher and provided through the courtesy of the Jet Propulsion Laboratory, California Institute of Technology, under a contract with the National Aeronautics and Space Administration. 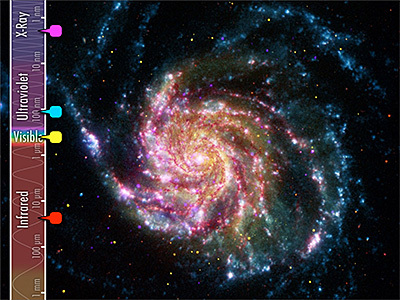 This image of M101 combines images from four different telescopes, each detecting a different part of the spectrum. Red indicates infrared information from Spitzer’s 24-micron detector, and shows the cool dust in the galaxy. Yellow shows the visible starlight from the Hubble telescope. Cyan is ultraviolet light from the Galaxy Evolution Explorer space telescope, which shows the hottest and youngest stars. And magenta is X-ray energy detected by the Chandra X-ray Observatory, indicating incredibly hot activity, like accretion around black holes. When you see spectacular space images taken in infrared light by the Spitzer Space Telescope and other non-visible-light telescopes, you may wonder where those beautiful colors came from? After all, if the telescopes were recording infrared or ultraviolet light, we wouldn’t see anything at all. So are the images “colorized” or “false colored”? No, not really. The colors are translated. Just as a foreign language can be translated into our native language, an image made with light that falls outside the range of our seeing can be “translated” into colors we can see. Scientists process these images so they can not only see them, but they can also tease out all sorts of information the light can reveal. For example, wisely done color translation can reveal relative temperatures of stars, dust, and gas in the images, and show fine structural details of galaxies and nebulae. Spitzer’s Infrared Array Camera (IRAC), for example, is a four-channel camera, meaning that it has four different detector arrays, each measuring light at one particular wavelength. Each image from each detector array resembles a grayscale image, because the entire detector array is responding to only one wavelength of light. However, the relative brightness will vary across the array. So, starting with one detector array, the first step is to determine what is the brightest thing and the darkest thing in the image. Software is used to pick out this dynamic range and to re-compute the value of each pixel. This process produces a grey-scale image. At the end of this process, for Spitzer, we will have four grayscale images, one for each for the four IRAC detectors. Matter of different temperatures emit different wavelengths of light. A cool object emits longer wavelengths (lower energies) of light than a warmer object. So, for each scene, we will see four grayscale images, each of them different. Normally, the three primary colors are assigned to these gray-scale images based on the order they appear in the spectrum, with blue assigned to the shortest wavelength, and red to the longest. In the case of Spitzer, with four wavelengths to represent, a secondary color is chosen, such as yellow. So images that combine all four of the IRAC’s infrared detectors are remapped into red, yellow, green, and blue wavelengths in the visible part of the spectrum. Download a new Spitzer poster of the center of the Milky Way. On the back is a more complete and colorfully-illustrated explanation of the “art of space imagery.” Go to spaceplace.nasa.gov/posters/#milky-way. This false-colored Cassini image of Saturn was taken in near-infrared light on January 12, 2011. Red and orange show clouds deep in the atmosphere. Yellow and green are intermediate clouds. White and blue are high clouds and haze. The rings appear as a thin, blue horizontal line. 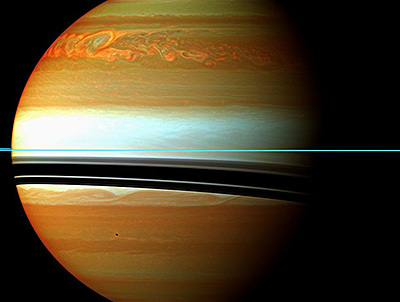 From December 2010 through mid-summer 2011, a giant storm raged in Saturn’s northern hemisphere. It was clearly visible not only to NASA’s Cassini spacecraft orbiting Saturn, but also astronomers here on Earth — even those watching from their back yards. The storm came as a surprise, since it was about 10 years earlier in Saturn’s seasonal cycle than expected from observations of similar storms in the past. Saturn’s year is about 30 Earth years. Saturn is tilted on its axis (about 27° to Earth’s 23°), causing it to have seasons as Earth does. But even more surprising than the unseasonal storm was the related event that followed. First, a giant bubble of very warm material broke through the clouds in the region of the now-abated storm, suddenly raising the temperature of Saturn’s stratosphere over 150 °F. Accompanying this enormous “burp” was a sudden increase in ethylene gas. It took Cassini’s Composite Infrared Spectrometer instrument to detect it. Chemical reaction rates vary greatly with the energy available for the process. Saturn’s seasonal changes are exaggerated due to the effect of the rings acting as venetian blinds, throwing the northern hemisphere into shade during winter. So when the Sun again reaches the northern hemisphere, the photochemical reactions that take place in the atmosphere can speed up quickly. If not for its rings, Saturn’s seasons would vary as predictably as Earth’s. But there may be another cycle going on besides the seasonal one. Computer models are based on expected reaction rates for the temperatures and pressures in Saturn’s atmosphere, explains Edgington. However, it is very difficult to validate those models here on Earth. Setting up a lab to replicate conditions on Saturn is not easy! Also contributing to the apparent mystery is the fact that haze on Saturn often obscures the view of storms below. Only once in a while do storms punch through the hazes. Astronomers may have previously missed large storms, thus failing to notice any non-seasonal patterns. As for atmospheric events that are visible to Earth-bound telescopes, Edgington is particularly grateful for non-professional astronomers. While these astronomers are free to watch a planet continuously over long periods and record their finding in photographs, Cassini and its several science instruments must be shared with other scientists. Observation time on Cassini is planned more than six months in advance, making it difficult to immediately train it on the unexpected. That’s where the volunteer astronomers come in, keeping a continuous watch on the changes taking place on Saturn. Go to http://saturn.jpl.nasa.gov/ to read about the latest Cassini discoveries. For kids, The space Place has lots of ways to explore Saturn at http://spaceplace.nasa.gov/search/cassini/. Our solar system is represented by the middle scenario, where the gas giant planet has migrated inward, but still remains beyond the asteroid belt. But there are other conditions besides temperature that make our part of the solar system comfortable for life. Using infrared data from the Spitzer Space Telescope, along with theoretical models and archival observations, Rebecca Martin, a NASA Sagan Fellow from the University of Colorado in Boulder, and astronomer Mario Livio of the Space Telescope Science Institute in Baltimore, Maryland, have published a new study suggesting that our solar system and our place in it is special in at least one other way. 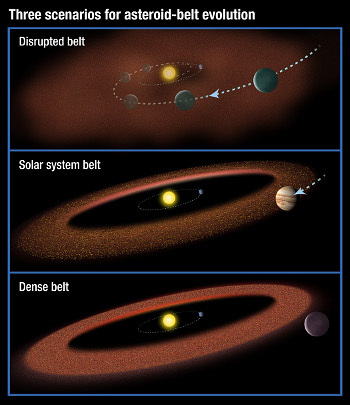 This fortunate “just right” condition involves Jupiter and its effect on the asteroid belt. Many other solar systems discovered in the past decade have giant gas planets in very tight orbits around their stars. Only 19 out of 520 solar systems studied have Jupiter-like planets in orbits beyond what is known as the “snow line”—the distance from the star at which it is cool enough for water (and ammonia and methane) to condense into ice. Scientists believe our Jupiter formed a bit farther away from the Sun than it is now. Although the giant planet has moved a little closer to the Sun, it is still beyond the snow line. So why do we care where Jupiter hangs out? Well, the gravity of Jupiter, with its mass of 318 Earths, has a profound effect on everything in its region, including the asteroid belt. The asteroid belt is a region between Mars and Jupiter where millions of mostly rocky objects (some water-bearing) orbit. They range in size from dwarf planet Ceres at more than 600 miles in diameter to grains of dust. In the early solar system, asteroids (along with comets) could have been partly responsible for delivering water to fill the ocean of a young Earth. They could have also brought organic molecules to Earth, from which life eventually evolved. Jupiter’s gravity keeps the asteroids pretty much in their place in the asteroid belt, and doesn’t let them accrete to form another planet. If Jupiter had moved inward through the asteroid belt toward the Sun, it would have scattered the asteroids in all directions before Earth had time to form. And no asteroid belt means no impacts on Earth, no water delivery, and maybe no life-starting molecules either. Asteroids may have also delivered such useful metals as gold, platinum, and iron to Earth’s crust. But, if Jupiter had not migrated inward at all since it formed father away from the Sun, the asteroid belt would be totally undisturbed and would be a lot more dense with asteroids than it is now. In that case, Earth would have been blasted with a lot more asteroid impacts, and life may have never had a chance to take root. The infrared data from the Spitzer Space Telescope contributes in unexpected ways in revealing and supporting new ideas and theories about our universe. Read more about this study and other Spitzer contributions at spitzer.caltech.edu. Kids can learn about infrared light and enjoy solving Spitzer image puzzles at spaceplace.nasa.gov/spitzer-slyder. 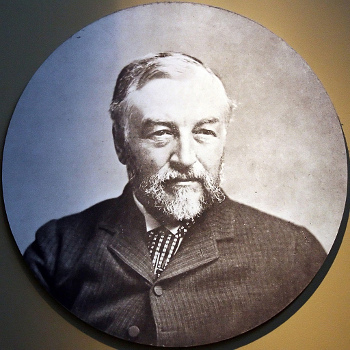 Samuel Pierpoint Langley, who developed the bolometer in 1878. His instrument detects a broad range of infrared wavelengths, sensitive to differences in temperature of one hundred-thousandth of a degree Celsius (0.00001 C). In 1961, Frank Low developed the germanium bolometer, which is hundreds of times more sensitive than previous detectors and capable of detecting far-infrared radiation. Vast fields of marble-sized chunks of ice and rock spun slowly in the darkness this week, and I sat in the back of a grey conference room with white plastic tables spread with papers and laptops. I was sitting in on a meeting of an international team of astronomers gathered to analyze data from the Herschel Infrared Observatory. This telescope, sometimes just called Herschel, orbits the Sun about a million miles from the Earth. The meeting began with dinner at Karl’s house. Karl charred chorizo on the backyard grill while the airplanes dribbled into Dulles airport. Our colleagues arrived, jet-lagged and yawning, from Germany, Sweden, and Spain, and we sat on Karl’s couches catching up on the latest gossip. The unemployment level in Spain is about twenty percent, so research funding there is hard to come by these days. That’s not nice to hear. But it cheered us up to be with old friends. The meeting commenced the next morning, as the vast fields of ice and rock continued to spin — shards glinting in the starlight. Or maybe they didn’t. Maybe they didn’t exist at all. You see, this team is looking at a series of images of stars taken by a device called a bolometer that is blind to ordinary starlight. Instead, the bolometer inside Herschel senses infrared light, a kind of light that we would probably refer to as heat if we could feel it. But the idea of pointing the bolometer at the stars was not to collect ordinary starlight. It was to measure heat coming from the vicinity of these stars, like an infrared security camera, in case there was something else to be found lurking nearby. And lo and behold, for a handful of stars, the bolometer measurements were off the charts! Maybe something was orbiting these stars. From the details of the bolometer readings — which channels lit up and so on — you would guess that this stuff took the form of majestic fields or rings of icy and rocky particles. It would be a new kind of disk, a discovery worth writing home to Madrid about. There are several teams of astronomers analyzing data from the Herschel Space Telescope. They call themselves by oddly inappropriate sounding acronyms: GASPS, DUNES, DEBRIS. For the time being, the scientists on these teams are the only ones with access to the Herschel data. But in January, all the data these teams are working on will suddenly be released to the public. So they are all under pressure to finish their work by then. The team whose meeting I was sitting in on would like to publish a paper about the new disks by then. But it’s not so simple. The stars that this team had measured were relatively nearby as stars go, less than a few hundred light years. But the universe is big, and full of galaxies of all kinds—a sea of galaxies starting from maybe a hundred thousand light years away, and stretching on and on. Maybe one of those background galaxies was lined up with each of the stars that had lit up the bolometer — fooling us into thinking they were seeing disks around these stars. The team argued and paced, and then broke for lunch. We marched to the cafeteria through the rain. Meanwhile, vast fields of marble-sized chunks of ice and rock spun slowly in the darkness. Or maybe they didn’t. What else did Herschel recently uncover? Find out at http://spaceplace.nasa.gov/comet-ocean. Dr. Marc J. Kuchner is an astrophysicist at the Exoplanets and Stellar Astrophysics Laboratory at NASA’s Goddard Space Flight Center. NASA’s Astrophysics Division works on big questions about the origin and evolution of the universe, galaxies, and planetary systems. Explore more at http://www.science.nasa.gov/astrophysics/. The New Moon may become kids’ favorite Moon phase after they have done the new Cookie Moon activity on NASA’s Space Place. That’s because they get to lick off all the creme filling on an Oreo® cookie. This is a fun way for kids to learn why the Moon has phases and why it looks the way it does throughout the month—not an easy concept for anyone! This activity will be a sweet experience for all! Go to http://spaceplace.nasa.gov/oreo-moon. Distributed by Laura K. Lincoln, on behalf of the Space Place Team. In this poster art of Mariner 4, you can see the parabolic reflector atop the spacecraft bus. Like the reflector inside a flashlight, it sends a beam of electromagnetic energy in a particular direction. Credit: NASA/JPL/Corby Waste. 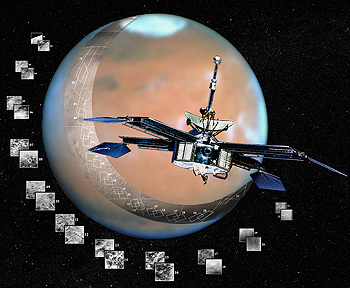 The Mariner 4 experiment revealed Mars’ thin atmosphere. Since then, successful radio science occultation experiments have been conducted at every planet and many large moons. And another one is on schedule to investigate Pluto and its companion Charon, when the New Horizons spacecraft flies by in July 2015. Also, during that flyby, a different kind of radio science occultation experiment will investigate the gravitational field. The most recent radio science occultation experiment took place September 2, 2012, when the Cassini spacecraft carried its three transmitters behind Saturn. These three different frequencies are all kept precisely “in tune” with one another, based on a reference frequency sent from Earth. Compared to observations of the free space for calibration just before ingress to occultation, the experiment makes it possible to tease out a wide variety of components in Saturn's ionosphere and atmosphere. Find out more about spacecraft science experiments in “Basics of Space Flight,” a website and book by this author, http://www2.jpl.nasa.gov/basics. Kids can learn all about NASA’s Deep Space Network by playing the “Uplink-Downlink” game at http://spaceplace.nasa.gov/dsn-game. 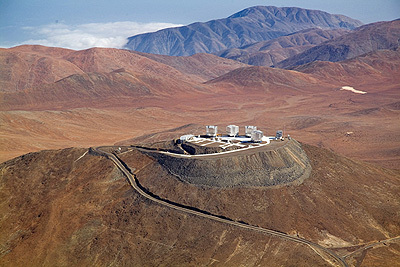 European Southern Observatory at Mt. Paranal, Chile. First a caravan of white observatory cars arrives, winding up the narrow road to the 2600-m- (∼8500-foot-) high summit. Then the shutters around the domes open, and rays from the setting sun alight on colossal mirrors and metal struts. It’s the beginning of another busy night at Mt. Paranal, Chile, where I am learning about new, more efficient ways of managing a modern observatory. I stepped into the observatory’s control room to soak up some of the new, unfamiliar culture. Here, under florescent lights and drop ceilings are banks of computer screens, one bank to control each of the four big telescopes on the mountaintop and a few others too. At each bank sits two people, a telescope operator and an astronomer. The layout of this workspace was not unfamiliar to me. But the way these Mt. Paranal astronomers work certainly was. When I was cutting my teeth at Mt. Palomar observatory in California, I would only go to the telescope to take my own data. In stark contrast. everyone observing at Mt Paranal tonight is taking data for someone else. The Mt. Paranal astronomers each spend 105 nights a year here on the mountain performing various duties, including taking data for other astronomers. The latter, they call “executing the queue.” Headquarters in Germany decides what parts of the sky will have priority on any given night (the queue). Then the Mt. Paranal astronomers march up the mountain and carry out this program, choosing calibrators, filling the log books, and adapting to changing conditions. They send the data back to headquarters, and from there it makes its way out to the wider astronomical community for study. This new way of working allows the Mt. Paranal astronomers to specialize in just one or two telescope instruments each. Surely this plan is more efficient than the old-fashioned way, where each of us had to learn every instrument we used from scratch—sifting through manuals at 3:00 AM when the filter wheel got stuck or the cryogen ran out, watching precious observing time tick away. Here at Mt. Paranal, much of the work is done in a big room full of people, not off by yourself, reducing some dangers of the process. Also, queue observing cuts down on plane travel, an important step for cutting carbon emissions. It’s a brand new age, I thought as I watched the giant domes spin in the silent, cold Chilean night. And maybe with queue observing, some of the romance is gone. Still, my colleagues and I couldn’t help saying as we stared out across the moonlit mountains: I can’t believe how lucky we are to be here. Dr. Marc J. Kuchner is an astrophysicist at the Exoplanets and Stellar Astrophysics Laboratory at NASA’s Goddard Space Flight Center. NASA’s Astrophysics Division works on big questions about the origin and evolution of the universe, galaxies, and planetary systems. Explore more at http://www.science.nasa.gov/astrophysics/. Kids can explore these topics at http://spaceplace.nasa.gov/space. How Many Discoveries Can You Make in a Month? This year NASA has announced the discovery of 11 planetary systems hosting 26 planets; a gigantic cluster of galaxies known as “El Gordo;” a star exploding 9 billion light years away; alien matter stealing into the solar system; massive bullets of plasma racing out of the galactic center; and hundreds of unknown objects emitting high-energy photons at the edge of the electromagnetic spectrum. Within NASA’s Science Mission Directorate, the Astrophysics Division produces such a list nearly every month. Indeed, at this very moment, data is pouring in from dozens of spacecraft and orbiting observatories. “The Hubble, Spitzer, Chandra, and Fermi space telescopes continue to make groundbreaking discoveries on an almost daily basis,” says NASA Administrator Charlie Bolden . ⚫ Finding new planets — and possibly new life — around other stars. ⚫ Discovering the nature of dark energy and dark matter. ⚫ Understanding how stars and galaxies have evolved since the Big Bang. ⚫ Studying exotic physics in extreme places like black holes. Observing time on Hubble and the other “Great Observatories” is allocated accordingly. Smaller missions are important, too: The Kepler spacecraft, which is only “medium-sized” by NASA standards, has single-handedly identified more than 2300 planet candidates. Recent finds include planets with double suns, massive “super-Earths” and “hot Jupiters,” and a miniature solar system. It seems to be only a matter of time before Kepler locates an Earth-sized world in the Goldilocks zone of its parent star, just right for life. A future astrophysics mission, the James Webb Space Telescope, will be able to study the atmospheres of many of the worlds Kepler is discovering now. The telescope’s spectrometers can reveal the chemistry of distant exoplanets, offering clues to their climate, cloud cover, and possibilities for life. That’s not the telescope’s prime mission, though. With a primary mirror almost 3 times as wide as Hubble’s, and a special sensitivity to penetrating infrared radiation, Webb is designed to look into the most distant recesses of the universe to see how the first stars and galaxies formed after the Big Bang. It is, in short, a Genesis Machine. Says Bolden, “We’re on track in the construction of the James Webb Space Telescope, the most sophisticated science telescope ever constructed to help us reveal the mysteries of the cosmos in ways never before possible.” Liftoff is currently scheduled for 2018. How long will the list of discoveries be in January of that year? Stay tuned for Astrophysics. For more on NASA’s astrophysics missions, check out http://science.nasa.gov/astrophysics/. Kids can get some of their mind-boggling astrophysics questions answered by resident Space Place astrophysicist “Dr. Marc” at http://spaceplace.nasa.gov/dr-marc-space.